Simple Appointments is a new software program that easily manages multiple staff in a professional studio or office. 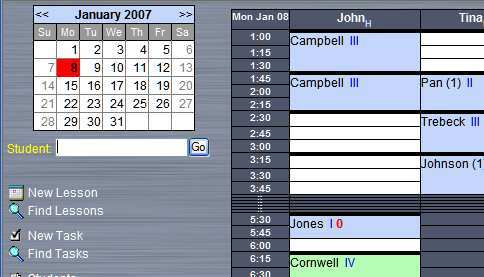 Designed as a replacement to the large grid of paper-and-pencil scheduling, Simple Appointments adds significant advantages like quick searching and automatic reconciliation without sacrificing the ease and speed of low-tech solutions. Simple Appointments not only tracks customer enrollments and payments, but reminds you when payments are due and alerts you if a customer is over budget. Numerous reports are available, completed with no additional effort, including weekly staff reports, income analysis, and official franchise reports. A version of Simple Appointments has been recently customized for Arthur Murray Dance Studio franchises and we can customize a solution for any business or organization.